This week’s MotoGP race was one for the record books. The top four riders traded places 53 (FIFTY-THREE!) times during the course of the race, and the ending came down to the last few turns. Here’s a breakdown of why this race was so amazing. The Phillip Island round of MotoGP is always a good one. It’s usually close, there is always a ton of passing, and it has wildlife on the track more often than not. This year’s race was no different, and the four riders who battled for first did so from lap one. But that isn’t how it was supposed to go down. 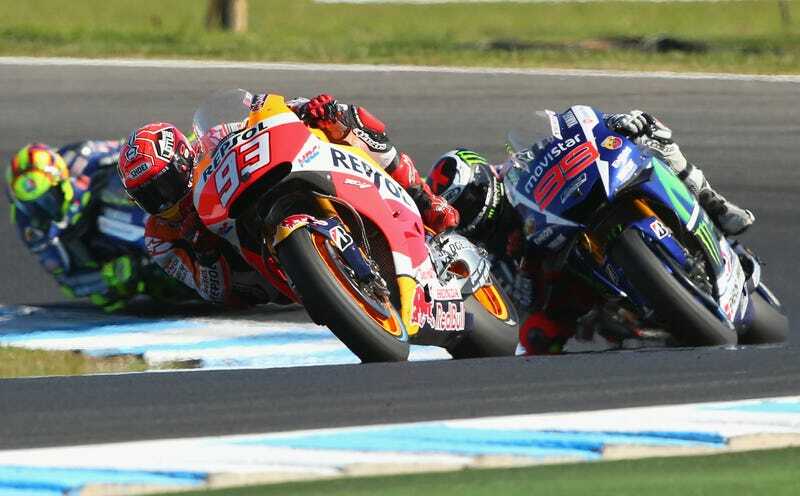 Marquez had qualified with ungodly speeds, and the general consensus going into the race was that he would jump to the lead and pull away as Lorenzo and Rossi fought for second. Rossi, who came into the race in the points lead for the season, was expected to best Lorenzo and try and increase his points lead before heading to Malaysia and Valencia, where Lorenzo is nearly unbeatable. Luckily for us, things don’t always go as planned. The track itself played an interesting role in the race (bird aside). Phillip Island is a fast track, and really only has two turns that aren’t taken at high speeds. Andrea Iannone rode a great race, but I highly doubt he’d have been able to stay in the mix without the ability to catapult back into it on the straight. Iannone’s ability to carry speed through the sweepers and into the straights also played a massive role in keeping this race close, because it allowed Rossi to slipstream. A commenter in our post about his hitting the bird commented that he rode the best of the bunch and would be amazing if not on the Ducati, but methinks that Desmosedici and its top end advantage were a major reason for Iannone’s performance. Nearly every pass Iannone made was in the straight, save for the incredibly sphincter clinching one where he caught Marquez and Rossi sleeping (gif below). Usually, when Lorenzo pops out front, he’s just gone. The rest of the pack are left to get in each other’s way while he adds clean lap to clean lap as he pulls away. At first, it looked like Lorenzo was going to be able to get away as Rossi and Marquez fumbled over each other, but once Marquez got around Rossi he was able to keep Lorenzo from Lorenzoing while Iannone and Rossi caught up. There were 53 passes between Iannone, Rossi, Marquez, and Lorenzo throughout the course of the race. With each lap, the pass count and the aggressiveness of the passing seemed to increase, with plenty of close calls. Marquez seems to ride with zero concern for his own well being which, while it often leads to him weeding, is also part of what makes him so great. Iannone had the most passes on the day with 18, thanks to the straight, and Marquez was right behind him with 17. The final lap started with Lorenzo in first, with Iannone six tenths of a second behind in second - which lasted only until turn one when he ran slightly wide and gave Marquez and opening. 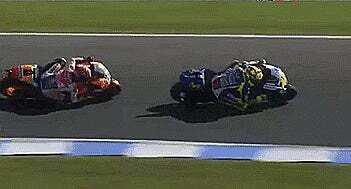 From there, Marquez was off on one of the best laps of his life. It was visible, even to a relative newcomer to the sport like me, that he was pushing hard and he made up ground by braking insanely deep into turn four. When they got to turn nine, called “Lukey Heights,” Marquez saw an opening and attacked. While it looked like Lorenzo was going to come back, Marquez was able to hold onto the lead through turn 11 for the win. Iannone, who had dropped back to fourth, made a move on Rossi in Lukey Heights as well, and closed the door on Rossi a turn later to clinch his spot on the podium. Coming into the race, Rossi had an 18 point lead over Lorenzo in the overall standings. After the race, his lead 1as been cut to 11 (although it would have been six if not for Marquez). Lorenzo has typically been faster in Malaysia and Valencia, which means Rossi could be in trouble. But, if this week showed us anything, it’s that anything can happen. Don’t miss this weekend (midnight on the west coast) as they head to the tight Sepang Circuit in Malaysia, where the faster Honda and Ducati won’t have the advantage, and see if Rossi can keep his lead.